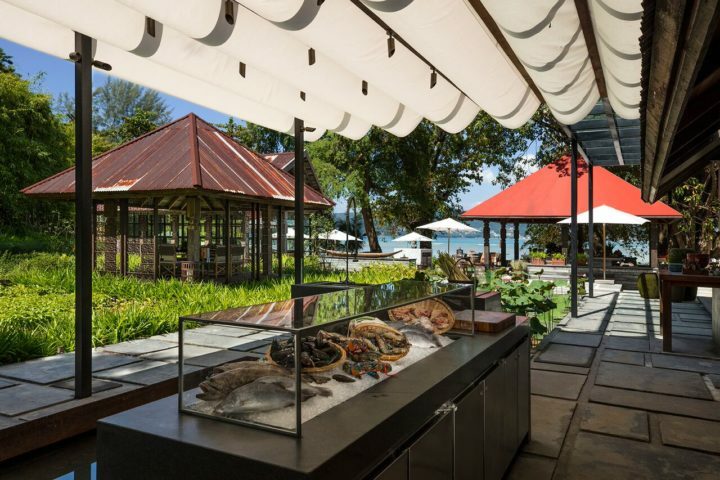 Authentic flavors, old recipes and seafood specialties in a rustic fisherman’s village setting, Ta Khai delivers Thai seafood and classic favorites in an idyllic setting. A new dining sensation has arrived in Phuket. 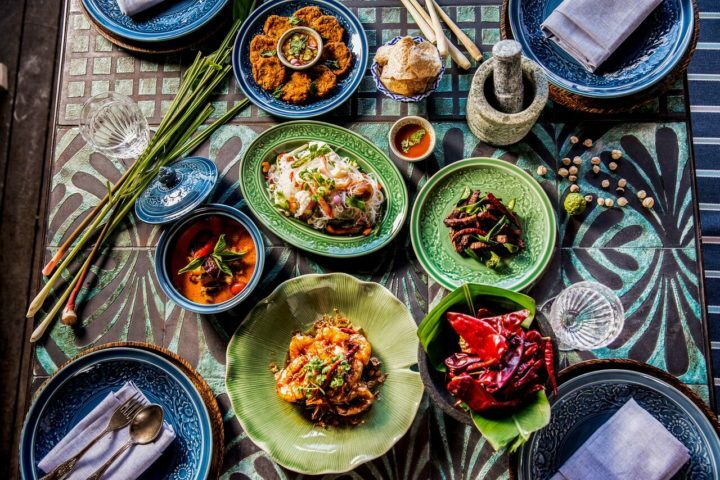 Generating loads of buzz across the island, newly opened Ta Khai is a rustic fisherman’s village serving elegant, authentic Thai cuisine in a charming setting. 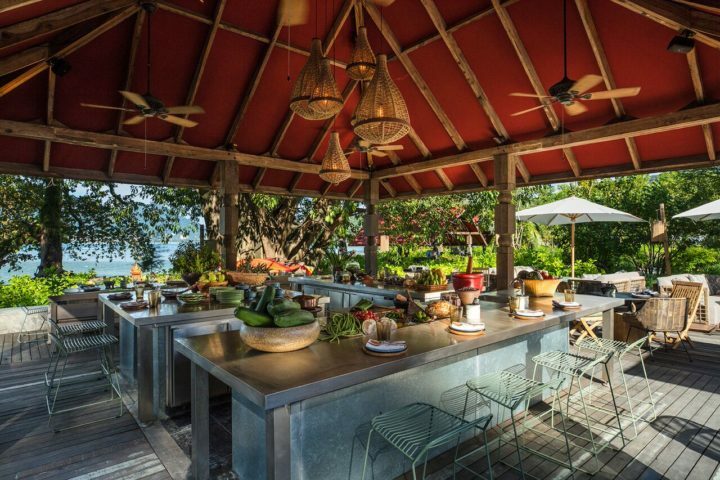 The restaurant is a stunning seaside enclave hugged by swaying coconut palms, dozens of bamboo trees, verdant foliage and centuries old banyan trees that straddle the shoreline, further enhancing the exceptional views across Emerald Bay. Nature plays an important part of the restaurant’s scenery and there is a massive, sacred ficus tree in the middle of the establishment. Wrapped in colorful silk ribbons and featuring a spirit house, Ta Khai staff pay homage to this tree every day. 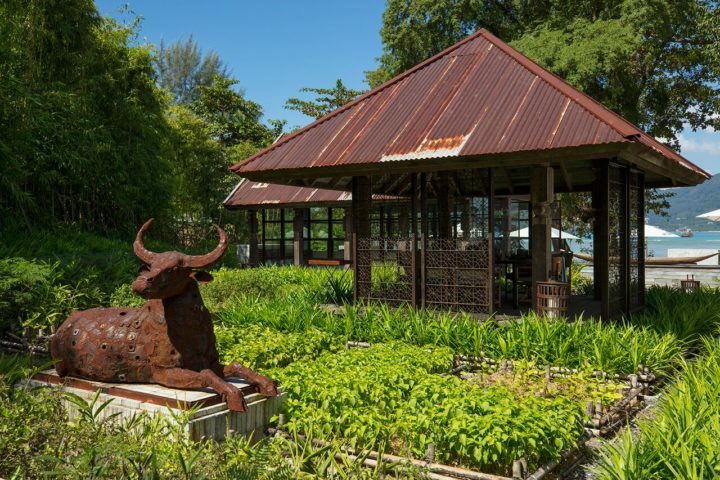 Featuring a contemporary open-air kitchen, catch of the day fishing pond and edible landscaping in the form of abundant herb and vegetable gardens, Ta Khai has deep roots in sustainability and endeavors to serve only the freshest, most authentic Thai cuisine. The restaurant excels in offering a unique five-star dining experience in a chic setting at cheerful prices. The menu features simple, traditional dishes bursting with bold flavors and spiciness levels to suit all palates. Popular menu items include Tod Mun Goong, Thai style shrimp cake with Thai herbs, an array of fresh, zesty Thai-inspired salads such a Som Tam, an incredibly refreshing papaya salad with dried shrimp, noodles and rice dishes including everyone’s favorite, Pad Thai . Soup and Curry varieties are also on offer, but the real standout menu items come from the local fisherman’s daily catch. Plucked fresh from the Andaman Sea daily, the seafood at Ta Khai is of the highest quality and can be steamed, grilled or wok-fried. Thai herbs and spices really up the ante of the dishes, and those looking for a definitive Thailand experience can rest assured that the dining experience at Ta Khai is one of the best. A lovely feature of the menu is the Uncle Nun and Aunt Yai Favorites section. Highlighting the best of the best, the chefs recommend such favorites at Moo Hong, Soy braised pork with black pepper and garlic, and the famous Gaeng Poo, which is a rich, delicious crab yellow curry with betel leaves, coconut milk and rice vermicelli. It truly is a luscious dish that highlights so many of the flavors Thai food is renowned for. For those who have a difficult time deciding, Ta Khai offers two different set menus as well as Uncle Nun and Aunt Yai’s specially recommended set menu. Price points are beyond affordable and start at just 950 Thai baht. 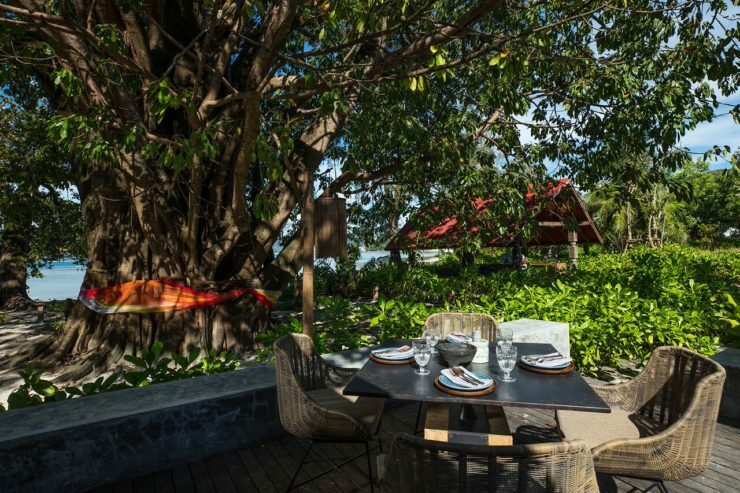 Nestled within a large gathering of towering, centuries old banyan trees, every fiber of Ta Khai tells a story. Handcrafted furniture, intricately woven silks and attractive place settings really catch the eye and add subtle value to the already breathtaking venue. With keen attention to even the most careful detail, the restaurant is tropical, weathered and romantic. The setting is absolutely superb, while the architecture and design is breathtaking. The restaurant has done an exceptional job of conveying the sleepy, laidback feeling of a cozy Thai fisherman village. Seating arrangements are well-spaced, intimate yet casual, and guests are given the option of al fresco dining or a well-designed glass atrium featuring air conditioning. Bigger parties or large families can enjoy a private dining pavilion or semi-private seafront barbecue terrace. Ta Khai is located south of Patong in the Tri Trang Beach area on the road to Paradise Beach. The restaurant is well marked and easy to find. 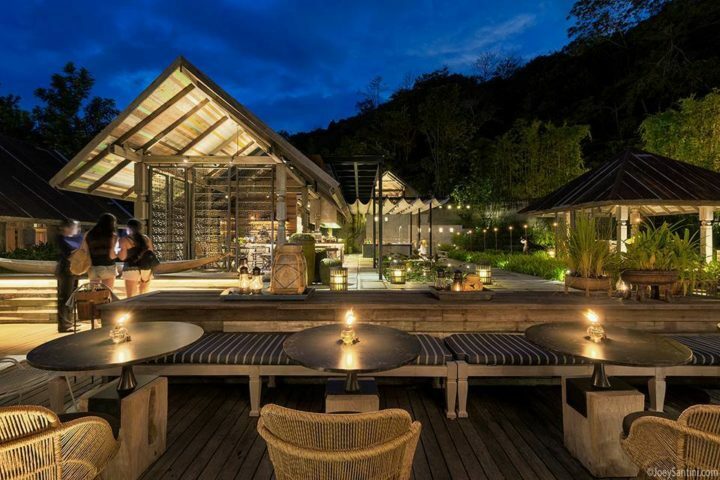 Part of the ultra-luxury Rosewood Phuket, the brand’s first Southeast Asia resort, Ta Khai is a stand-alone restaurant featuring public access and ample parking. There is private off road parking as well.